Do albatrosses have personalities? And if so, how do scientists measure such intangible characteristics? This blog provides some of the background to research Te Papa scientists were involved in, examining how birds use their environment, and how individual personality traits of these birds can be measured. The previous blogs on this topic can be accessed here. Meet Betsy the cow, a small plastic ‘space-hopper’ toy. She was used in testing albatross personality as a ‘novel object’ and birds reactions to meeting her were evaluated. Photo: Susan Waugh. Copyright Te Papa. 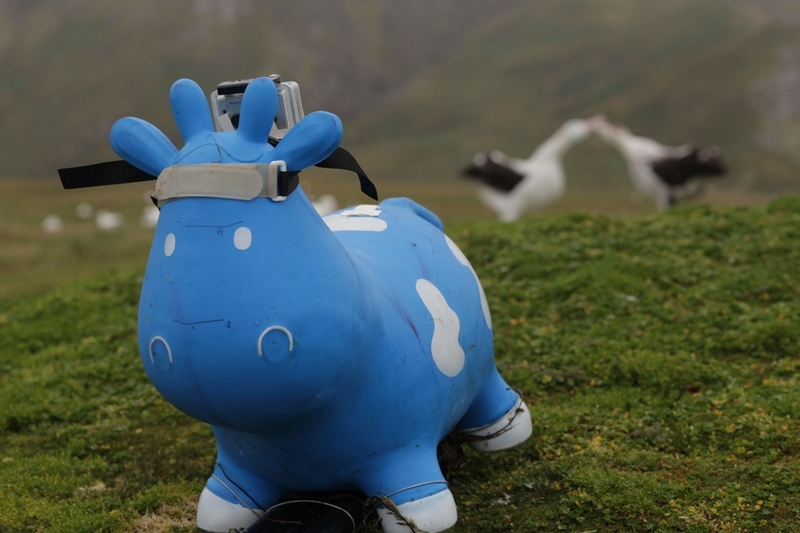 Measuring albatross personality requires a “novel object”, in this case “Betsy”, a blue inflatable cow. The gist of the research was to categorise individual birds into shy or bold personality types, based on their responses to the “novel object”, and to relate other aspects of their life-history and behaviour to the fit along the bold-shy continuum of personality. 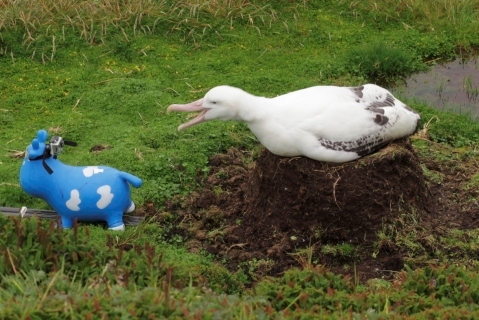 Research assistant Julien Collet presents Betsy to an unsuspecting albatross on the nest. Photo: Susan Waugh. Copyright: Te Papa. A bird with a ‘bold’ response to meeting Betsy, clacks its bill and grumbles as Betsy is pulled away. Image: Susan Waugh. Copyright: Te Papa. For example, a bird that was more ‘grumpy’ at being introduced to Betsy, might be bolder and more adventurous at sea, exploring new foraging areas in foraging trips, or bring home more food to its chick. A shy bird might be more cautious, but might be a surer parent or partner, and more reliable. 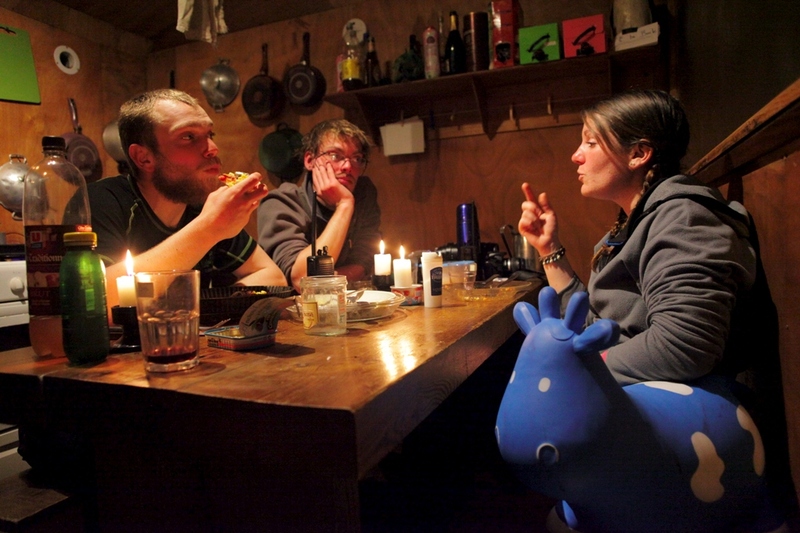 A discussion in the field hut around the days activities. Betsy was a keen contributor to how we developed our testing regime. Left to right: Research assistants Tim Poepart, Julien Collet and CNRS researcher Dr Samantha Patrick. Image: Susan Waugh; Copyright: Te Papa. These were the kinds of relationships we were trying to explore. Our job was to codify the behaviour of the birds in standard ways, so we could compare the birds on the same scale and then relate their personality score to other behaviours and nesting success. Birds attitudes to the blue cow were varied. Some outright ignored her! Others were quite curious. And some were a bit un-nerved, and quite happy when she went away…with a bit of a snap or a growl to help her on her way. About halfway through the 5-week field trip a fatal blow was delivered to Betsy’s rump, when a bird poked a hole in her, and there was a sudden sinking feeling throughout the team. Betsy was deflated! We retreated to the field hut, and got out the superglue and duck-tape and carried out emergency surgery. 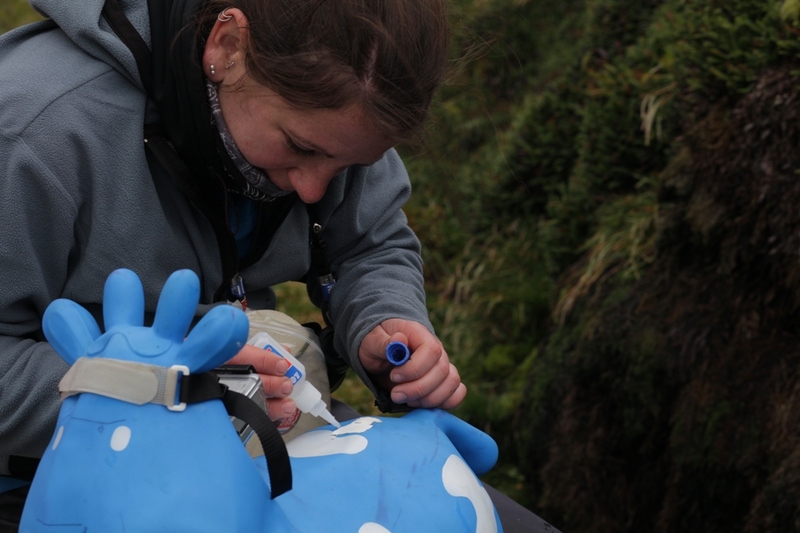 Samantha Patrick, CNRS research repairs Betsy after a particularly intense interaction with a ‘bold’ albatross. Image: Susan Waugh; Copyright: Te Papa. The research was led by CNRS researcher, Dr Samantha Patrick, who has specialised in bird behaviour and how personality influences what happens in their lives. Samantha conducted this study while working for the French Scientific Research Agency, CNRS, at the Crozet Islands, in the sub-Antarctic zone of the Indian Ocean. The science articles that provide the research background are available here. To see the short film we put together, that describes the work, check out Te Papa’s media channel. Te Papa is developing material for an exhibition on albatrosses. We’d be keen to hear from our readers about what topics interested you about albatross biology and personality. Thanks for your input on this, its a very fun and exciting piece of work to be involved with. The research is now written up in science publications which tell more about the motivations and interpretation than what we presented here. This is great research and filming. But are you just trying to make albatrosses into people? Like loads of people do with whales. Hi Sarah, yes it could be seen that way. It is a fairly ‘serious’ piece of science, though with some solid research publications behind it, and the attributes of shy or bold are really code for a certain type of behaviour, rather than anthropomorphising. The research publications are linked in the blog. All aspects are interesting because it expands our understanding of what its like to be a bird and an albatross in particular. Of course there are many kinds of bird and the life experience of an albatross is very different to that of an owl so every piece of biology (how is their hearing?) and behaviour (how do they recognise their mate?) helps to build a picture of how life is for them and where they fit into their niche in the world.